Retirement never looked so good – for the YOUNG guy! Something old (Stallone), something new (this film), something borrowed (the script from ROCKY), something blue (Talia Shire, excised from this story for dramatic impact and watching from the ropes as ROCKY BALBOA garners accolades as the best Rocky movie since ROCKY). Yes, it’s about resurrecting a staple source of income, mining a well long thought run dry – but there’s nothing wrong with that if it is done this compellingly. The problem with franchises revisiting their roots is that they neglect the very elements that earned them their laurels, going “Hollywood” to chase the wider demographics and the easy cash. Stallone has gone the way of the darker prequels and pared-down sequels, in giving us an earthy, gritty final chapter in the Rocky legacy, which makes for a sturdy bookend to the series. 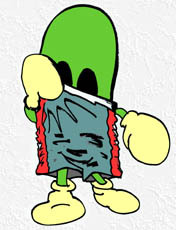 No blows below the belt. Bringing to mind two recent revampings, viewing ROCKY BALBOA is like watching BATMAN BEGINS (a grittier character study of a well-worn icon, using latest filmic techniques), but with the content of SUPERMAN RETURNS (the script for the first movie in the series dusted off and sold as original). The opening lines unashamedly foreshadow the plot, as we see current World Heavyweight Boxing Champion, Mason “The Line” Dixon (real-life light heavyweight champion, Antonio Tarver) in a television broadcast, being criticized as winning against losers in uninspiring matches (mayhaps a commentary on the state of boxing today? ), commentator opining that boxing is “looking for a warrior to thrill us with his passion.” Cue Rocky’s saddened Philadelphia existence, wife Adrian having died five years ago, the Italian Stallion now eking out a living managing a reasonably popular Italian restaurant called “Adrian’s” (with Mexican cooks – most definitely a commentary on the workforce of today). In yet another snide commentary – on the virtual world of the iPod and eFluenced generation – the plot is jogged into training by a televised computer matchup pitting a former boxing champ, Rocky, with the current champ, Dixon, Rocky’s pixels knocking out Dixon’s pixels, which – like the soft-minded real world of today – causes untold media debate and streetside squabbles pertaining to the “reality” of the computer’s decision. Whatever the metaphor, we gather that Rocky wants to taste his own blood again as it spurts from his gashed brow ridges and broken teeth. Just local matches, he asserts. But fate will once more trip him into the spotlight, as Dixon’s managers, with cash signs in their eyes, cajole Rocky into an exhibition match on the strength of the public outcry of the computer matchup. Cue – The Montage. Add Bill Conti‘s fanfare. Add beefcake. Serve hot. Enjoy. Admit it – every time you hear those blaring horns you make a promise to yourself to lose some pounds via one-handed pushups. Conti’s Rocky theme (Gonna Fly Now, birthed to be married to the ROCKY franchise forever, amen) stands as tall as Lalo Schifrin’s MISSION IMPOSSIBLE theme or Ennio Morricone’s DOLLAR trilogy figures – as iconic as the movie it was created for. Burt Young was 36 when he made ROCKY. And he looked 60. Stallone is now 60. ROCKY BALBOA, like ROCKY, is not about boxing. It’s not about winning. Like ROCKY, it’s about heart. So no matter the improbability of a geezer going up against a freight train, it’s not about the outcome. 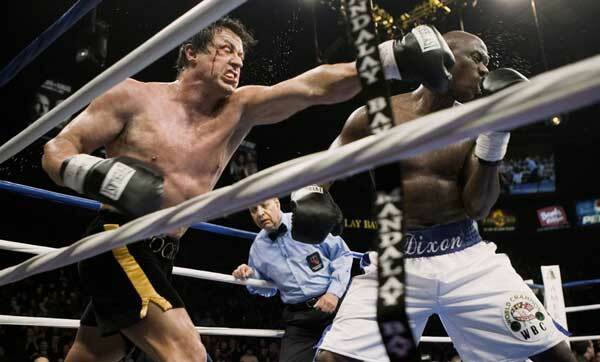 It’s about “going the distance.” And Stallone surely looks to be in the shape to do it. 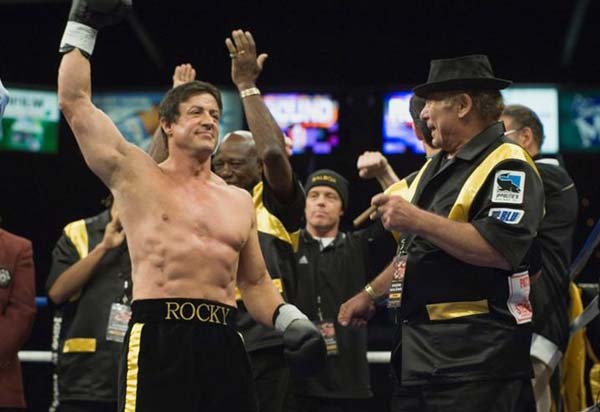 The only aspect that gives away his sexagenarian status is a few “old-man veins” in his right shoulder, otherwise, even if Stallone himself could never stand up to a real life champion half his age, it surely looks like Rocky could. Dixon is also given a compelling reason to enter this match which will make him a loser whether he wins or loses the bout. (He wins – he beat up an old man; he loses – an old man beat him up.) An old trainer tells him, “Pride is what brought you here. Losing it is what brought you back.” He may be a winner in the ring – but a loser when it comes to pride. He is not made out to be too shallow or villainous, which is credit on Stallone’s part, whose controlled directorial and writing style in this film evokes an Eastwood-ian self-composure. Even in Rocky’s first streetside scuffle, there is initially an expectation that we are going to see him pull the guns out – but the two-second pushing scene is merely a cinematic hiccup. There is no manipulative music or camera god-angles. Admittedly, the manipulation is saved for the final act, most obviously with Gotta Fly Now and then surprisingly, filmed entirely like a HBO pay-per-view sports event, with god-angles galore, which speaks derogatory volumes about our current sensibilities – meaning, real-life modern sports events have adopted the glam and slam of a Rocky movie, so filming this Rocky segment as if it was a real life event is an ironic case of art imitating life, which imitated art in the first place. The final fight scene also pays homage to Frank Miller’s sterling SIN CITY (2005) with certain shots in black and white with snatches of startling color. Dare I state the outcome? If you’ve seen ROCKY, you’ll know the ending. And Rocky/Stallone makes it clear that this will be Rocky’s swansong, “I’ve gotten rid of the Beast.” The end credits feature shots of people running up the famous stairs of the Philadelphia Museum of Art, putting a capper on the series, as we all realize, with a parting tear, that any more would definitely be parody. No more junk in the mezzanine. aka: ROCKY VI: PUNCHER’S CHANCE. Starring: Sylvester Stallone, Burt Young, Antonio Tarver, Geraldine Hughes, Milo Ventimiglia, Tony Burton, A.J. Benza, James Francis Kelly III, Talia Shire, Henry G. Sanders, Pedro Lovell, Ana Gerena, Angela Boyd, Mike Tyson.